I'm currently a Technical Marketing Engineer at Uila. As a TME, I come across some cool tech and work along with customers with various needs. The goal of this blog is to share the knowledge while gaining insights from the community. VXLAN or Virtual extensible LAN is a network overlay technology. 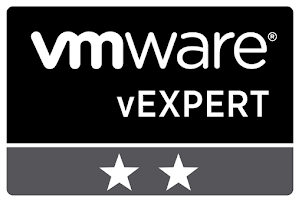 It was created by a consortium of VMware, Cisco, Intel and many others to improve scaling of the virtualized datacenter. In this article I will try to explain VXLAN in simple terms and provide a few interesting use cases and where it can be very useful. The router would route traffic between the 0.0 and the 0.1 network and all the VM’s on each host/cluster would be in the same IP ranges. Now, imagine you are an MSP with a large IT infrastructure. Each client provision their own servers across the multiple clusters. They need the servers in the different clusters to communicate with one another. In this case, the MSP would have to create separate routes and isolations across your underlying network. Imagine this environment had thousands of clusters and how cumbersome this could get? This is where VXLAN can help us. VXLAN is an encapsulation technology that allows UDP layer 2 over layer 3. The component that does the encapsulation is called VTEP (VXLAN Tunnel Endpoint) and VXLAN’s provide a 24 bit address space called VNI (VXLAN Network Identifier) to separate out the segments. Let’s get back to our MSP example. They have 2 customers(tenants), XMART and WONKA industries. Coincidentally both WONKA and XMART pick the same IP range (10.10.0./24). They have VM’s across the 2 clusters, but they need to have their VM’s communicate with one another without communicating with each other. In this case a VXLAN tunnel is created across the 2 clusters. Let’s say XMART and WONKA 10.10.0.1 is sending data to 10.10.0.2 on Cluster 2. 2) The VTEP would encapsulate it with a VXLAN header on top of the original L2 frame. The VXLAN to address – 192.168.1.10 and from 192.168.0.10. The UDP port 4789 is reserved for VXLAN. 3) The difference is in VNI. By using VNI 100, XMART can transmit the packet to the XMART server on host 2 and similarly for WONKA the VNI is 200. Hope this article provides a high-level overview for anyone trying to understand VXLAN. More and more organizations are virtualizing desktops than ever before. VMWare and Citrix have managed to attract organizations by simplifying the deployment and maintained of VDI’s. Security teams have also pushed for deploying VDI’s since it gets data off the edge and can be stored in a secure, centralized datacenter. Moreover, many organizations have benefited by implementing VDI since it provides huge savings on the company’s high energy bills. Traditional PC’s can consume a lot of energy, whereas VDI end users generally use a thin-client that uses much lesser energy. a) Network Connectivity – Check the underlying network. For example, if a user complains on network issues, connect you laptop and see if you are able to connect to the network. Use basic tools such as ping and tracert to identify the point of failure. In case the user is accessing the VDI remotely, identify if the issue is on the gateway or the VPN. This also includes firewalls – Ensure the correct firewall ports are open. High Application and Network Latency usually cause sluggish behavior for the users. In case its Application latency, its important to understand the cause of the application latency. It could be the underlying infrastructure of the application server causing problems for your VDI environment. If it’s a network latency issue, it could be related to bandwidth contention and it is important to identify the bottlenecks, such as the WAN links immeadiately. A lot of the infrastructure issues are caused due to the ever-growing needs of the end-users. However, it can also be noted that the main culprit of an infrastructure issue is inadequate planning before setting up the VDI environment. 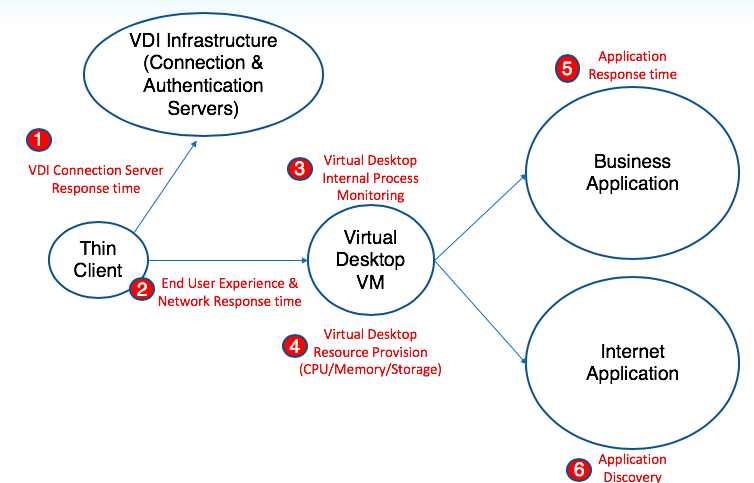 VDI desktops require to be provisioned with adequate CPU, Memory and Storage resources. Under-provisioning VM’s can cause performance issues, whereas over-provisioning can cause wastage of resources and could cause other issues such as CU ready. Rightsizing is more critical for persistent VDI’s since they are harder to change and maintain since they are static. It is critical to monitor the processes running in VM and understand which processes cause issues within your VDI. There could be defunct or zombie processes that need to be terminated immediately, which may cause severe end-user issues. 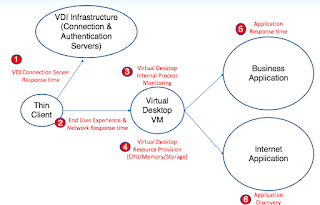 VDI troubleshooting can be simplified using the diagram below. The below diagram gives us an idea of where the problem lies in the infrastructure. Tools such as Uila can help identify the bottlenecks causing VDI issues and pin-point the user in the right direction.